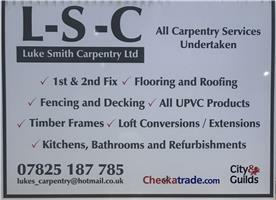 Luke Smith Carpentry Ltd - Builder, Carpenter, Fascia/Soffits/Guttering, Windows/Doors/Conservatories based in Fareham, Hampshire. L-S-C - Luke Smith Carpentry Ltd are a small local company, highly competent in all aspects of carpentry and general construction. With 12 years of Knowledge and experience, we are company supplying bespoke carpentry services to the commercial building sector and the residential carpentry construction sectors. We offer bespoke carpentry services. Our services include full property refurbishments, extensions, loft conversions, fitted kitchens, roofs, doors, wood flooring, cladding, decking and stairs. In fact, we can take on almost any project from its inception to completion using only experienced tradesmen who are fully certified/qualified we know and trust, ensuring your project is completed to the highest standard.